The CryoJane® Tape-Transfer System creates frozen sections as thin as 2 microns with the same quality as sections cut from paraffin blocks. Sections are wrinkle-free, uncompressed, and fully intact when bonded to the microscope slide. The CryoJane uses adhesive coated slides and adhesive tapes to capture sections instead of using an anti-roll plate or brush. CryoJane is suitable for routine cryosections and is indispensable for sectioning difficult tissues including fatty breast and undecalcified bone. With the CryoJane Tape-Transfer System, thin tissue sections remain unflawed even after mounting. This makes CryoJane ideal for applications that require perfectly thin sections to clarify structural relationships and reveal morphological detail. The CryoJane Tape-Transfer System is adaptable to most cryostats on the market. Ideal for fatty tissues - Keeps fatty tissues such as skin, breast & undecalcified bone together. Excellent for serial sections of brain. The Leica CryoJane Tape-Transfer System includes the control unit, (ECU) with a power cord, UV Flash Unit with Temperature Controlled Pad, Hand Roller and Mounting, Bracket, Door Bar, five Cable Clamps, one Slide Storage Shelf, 125 1X Adhesive Slides, 10 1/2X Adhesive Slides, 10 4X Adhesive Slides, one roll of Tape Windows (400 tapes per roll), a manual, one set of Replacement Fuses, Knife Facet Wipers and a one year Parts Warranty from date of install. Oil in the bath is maintained at –8°C inside the cryostat and will not melt the tissue when brushed on the frozen block-face. Frozen blocks coated with this protective oil can be stored for up to one year in a freezer without dehydration. The Protective Oil Accessories Kit includes the following: Temperature controlled Oil Bath, 4 oz Bottle of Protective Oil, and Oil Brush. 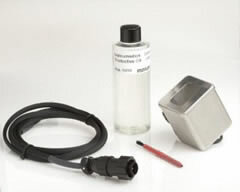 Please note that when purchased separately from the CryoJane system, installation of the Protective Oil Bath Accessory requires that the CryoJane® system be returned to Electron Microscopy Sciences. 62800-40 Block-Holder Deep-waffled, large face block-holder securely anchors frozen embedding medium or tissue. 62800-46 Hand Roller Required in the CryoJane® process for laminating Tape Window to block-face. 62800-53 Fuses - 1-Amp SLO-BLOW ceramic core wound. Used in the CryoJane™ ECU. 62800-X Adhesive Slides Glass slide with adhesive coating, when polymerized, bonds the still-frozen section from the tape to the slide. Avoid thawing the section. ½ x coating slides for mild to normal tissues. 62800-1X Adhesive Slides Glass slide with adhesive coating, when polymerized, bonds the still-frozen section from the tape to the slide. Avoid thawing the section. 1x coating slides for mild to normal tissues. 62800-4X Adhesive Slides Glass slide with adhesive coating, when polymerized, bonds the still-frozen section from the tape to the slide. Avoid thawing the section. 4x coating slides for use with hard un-calcified bone) or fatty tissues. 62800-72 Tape Windows Applied to the block-face with the Hand Roller to capture the frozen section as it is being cut. Eliminate the need for a brush or anti-roll device. 62800-74 Protective Oil Used for coating frozen section blocks to prevent dehydration during long-term storage. 62800-76 Aqueous Buffer Salt Mix Used in the preparation of the aqueous fixative, which preserves morphological detail in frozen sections. 2 vials per package, (each vial makes 180 ml of buffer). *Installation of the Protective Oil Bath Accessory requires that the CryoJane® system be returned to Electron Microscopy Sciences. It is a highly viscous, water-soluble embedding medium for frozen sections that "stays put". The gel is packaged in a pump-dispenser bottle that can instantly dispense the gel in any position. The dispenser has a built-in"guillotine" that cleanly severs the gel from the pump spouts and prevents any "stringy" medium from pulling away when the bottle is removed. Simply dispense gel on room temperature blockholder. Use cold heat extractor to form a base layer. Dispense additional gel. Place the tissue on top of gel. Use cold heat extractor to freeze tissue and form block. Each bottle contains 4.3oz (159ml), 12/case. CureMount™ is a UV curable mounting medium of low viscosity for use with all dehydrated sections. CureMount™ is a polymer that cures to a refractive index of 1.55. It closely matches the refractive index of dehydrated tissue. The coverslip can be optimally positioned and cured under UV fluorescent illumination. The coversliped slide is "dry" in less than 30 seconds. The coverslip can easily be removed by heating the slide briefly, soon after curing or after a longer time by immersing in xylene. All unstained tissue elements and the cured polymer will be invisible, making the stained elements stand out in exquisite detail. Comes in brown glass dropping bottle, 60 ml. The Paraffin Tape-Transfer System is not available. Kit components are available for purchase.